After three weeks of my children being in school, it's clear that my willpower has been depleted. I know this because I have forgotten about some important things, despite the many reminders and writing them in my new, awesome planner. Because I yelled at all three of my children last night while we were working on homework. Because I have no motivation. Oh, and because I haven't been to the gym since the second day of school. 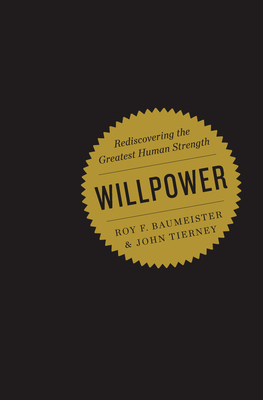 In the book Willpower: Rediscovering the Greatest Human Strength by Roy F. Baumeister and John Tierney, I learned that what we call willpower is not something I have in unlimited supply. In fact, every single thing for which I must use self-control depletes a little bit of that willpower until it's just plain gone. I read about study after study (and I must say, these authors have a way of making scientific studies entertaining--I loved reading them!) which discovered this fact. Which basically means that it's much easier to focus your willpower on one thing at a time. So go on a diet, get out of debt, or write a novel--just don't try to do all three at once because you're more likely to fail at all of them. I've definitely noticed this in my life. New Year's Resolutions have made me so very angry when I can't seem to muster up the willpower to accomplish more than one of them. It always seemed that one rose to the top and the rest fell off, which I suppose is better than failing at all of them, but it still made me mad. I was doing so well at the whole weight loss thing this past spring/summer until the opera started. Then, suddenly I was faced with memorizing difficult music and the focus of my willpower switched from making myself go to the gym every day and eating right and tracking my food to spending long hours sitting at the piano, going to rehearsals and eating all the licorice people kept leaving in the green room. I made a mediocre effort at my previous weight loss, then went on vacation and am now completely off of the wagon. Since school started, my willpower has been entirely focused on making myself get out of bed at 6:00 every morning (which, for me, requires pretty much my daily supply and does not really bode well in the willpower department for the rest of the day), getting Bria to practice her violin for an hour before 7:00, making lunches, getting everyone looking presentable, and getting us all to the bus on time. I have found myself plopping in front of the computer as soon as I get back from the bus stop instead of going to the gym like I WANT to. I just can't find the wherewithal. So, enough about me. Let's talk about this amazing book. Like I mentioned before, it's full of fascinating case studies regarding willpower and how it works in our brains. And then it gives practical advice for finding the willpower to do whatever it is you need to do. There is also a great chapter on teaching our children self-control (aka "willpower"), which is excellent. Study after study has shown that willpower/self-control is the single best predictor of how successful a child will be in her adult life. It is something we need to be teaching our children, and we need to especially remember that self-esteem comes from self-control, not the other way around. I was so appalled when, in the introduction, the authors mentioned that there are some scholars who would like to do away with "the outdated notions of free will and responsibility." Say WHAT? No wonder our society has so many problems! And nearly every one of those problems--debt, obesity, crime, divorce, etc.--can be traced back to the lack of self-control. Excellent book. Please read it if you feel you have "weak willpower." You'll love it. And, even better, you'll learn how to strengthen that willpower muscle. As for me? I think I'm going to try to get to the gym before I have to go to work this morning. That concept makes sense to me. I can do one thing well ... but then everything else suffers. And when I think of self-improvement, the list is too long, and I feel like if I only pick ONE thing on that list, I am choosing to not improve the rest. I really am going to read this book...it sounds really important to my currently under-motivated life. As a teacher, I can assure you that self-control is the character trait most missing from children. Life for everyone is so much easier when someone has self-control. So, how does one teach children self control? I guess I always thought it was something you were born with, not something learned. And what a fascinating topic! I am not one for self help books, but this one actually sounds pretty good. Now I am wondering, where on earth do you find the time to read? I barely have a chance to read other people's blogs, let alone write in my own. I love you, Lara, because you're real. You can tell us all about your strengths and great times, but you also don't try to hide your weakness and times of struggle. I find myself comparing myself to others, wondering why I'm not the mom who does all the things that all the other moms do, wondering why I'm not the great mom my own mother once was. I've been trying to realize that I just have different talents, and I need to focus on those, rather than compare myself with everyone else who all have different talents. I think willpower fits into this concept perfectly, as one has to have it in order to devolop their talents and ultimately quit comparing themselves to everyone else's strengths, in order to quit feeling guilty for what one isn't and use that guilt-free time to continue to develop more talents. I can't phrase the above exactly like I mean it, but I appreciate knowing that others also struggle with willpower to do things that they'd like to be better at. Thanks for sharing. --Amanda B. Awesome post. I really love knowing that I'm not the only one who struggles with some of these things...and it's soooo true--will-power seems to focus down to one thing for me and everything else falls by the wayside. I'm excited to check out this book. I'm glad this book resonated with you so much! Hopefully it also gave you some lessons that you can apply to willpower-draining situations in your own life.